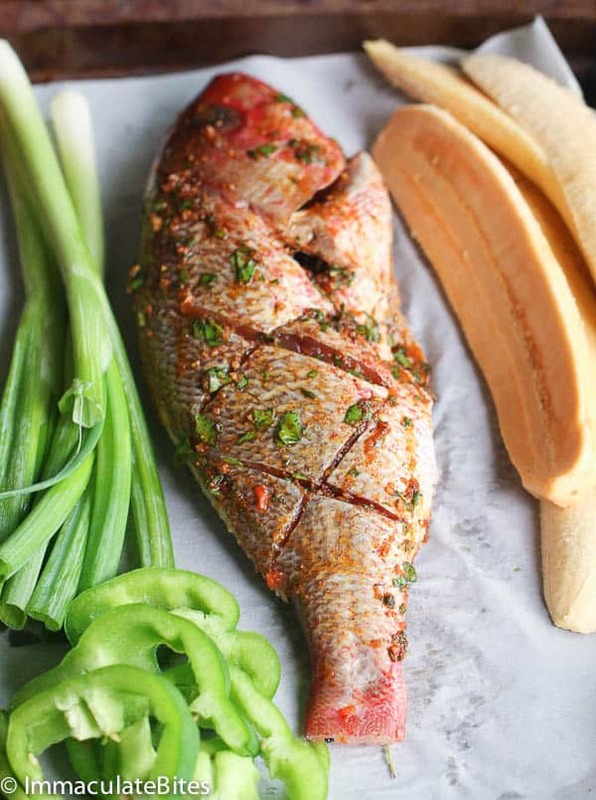 Caribbean Grilled Whole Red Snapper- Fairly Easy to make with a great blend of spice- Moist, tender and flavorful. Happy 4th of July Guys!!!!! Switch things up and add this to your celebration. Grilling can be quite daunting not to talk of fish, with it’s delicate flesh. Fear not! It’s quite doable and before you know it you are going to be grilling away like a pro. Yes yes yes! Why a whole fish? 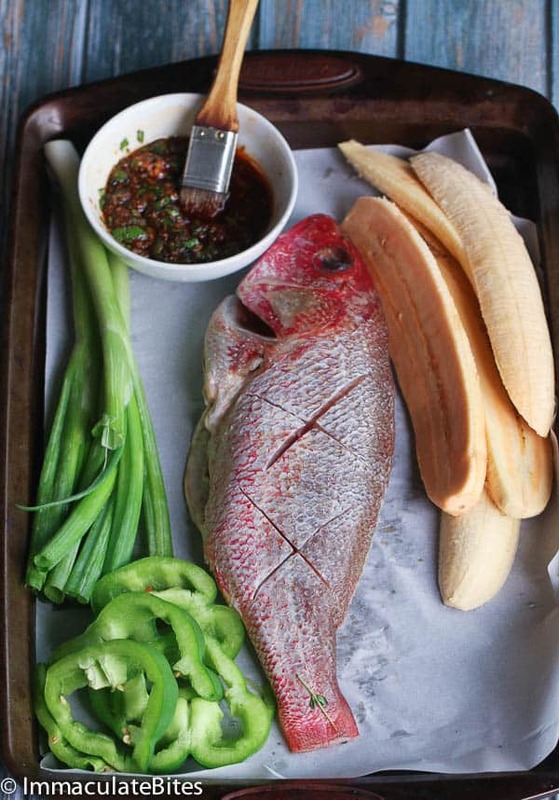 Cooking whole fish with bones, skin and all… keeps the fish moist and seals in the flavor. Especially when you are dealing with red snapper. 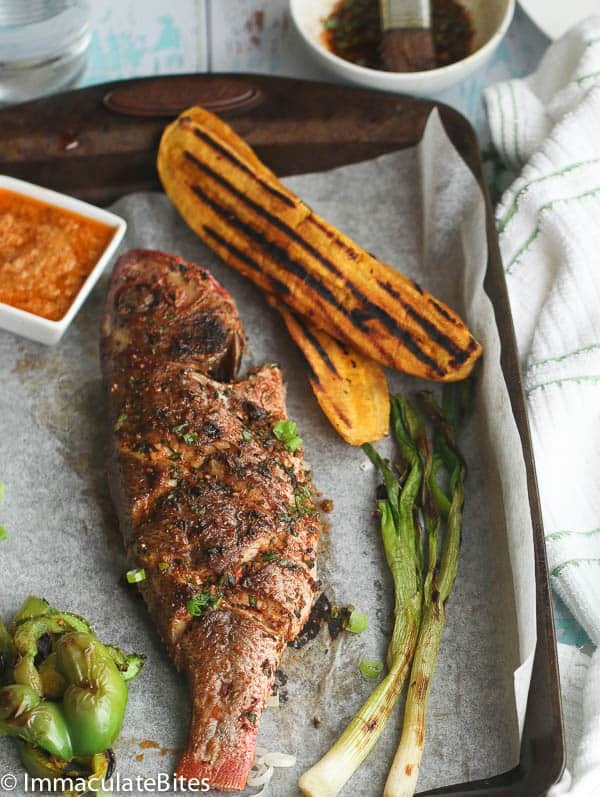 Red snapper requires a little extra love to keep it from falling apart on the grill. An easy way to get around it is to use a grill baske or a fish basket, it so helps in flipping the fish. I can’t tell you how many fishes I ruined trying to flip without a basket. It is an essential tool especially for a beginner. If you want to purchase a grill fish basket they are available at department stores and even some supermarkets, especially this time of the year. Once you get the heat going.. it is a breeze. Grill about 3-5 minutes on each side depending on the thickness of the fish. If for some reason the flame flares up, you can just lift the basket and place it aside. So don’t step way. Do not over cook it, it’s notorious for being rubbery when over cook. When fish is white and the juices must run clear, then you are set. If unsure check for doneness by making sure the meat closest to the bone is fully cooked – slash with a knife to check. Until you get the hang of it. 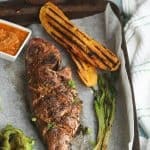 I know there are numerous ways of making grill fish at home, with each having it’s own unique taste. Here are a few spices to start with garlic, lemon, thyme, allspice, white pepper and the rest is up to you. Salt, pepper and lemon works great too! Be sure to oil the fish and basket before placing on the grill. While you are at it throw in some vegetables and or plantain. Enjoy! 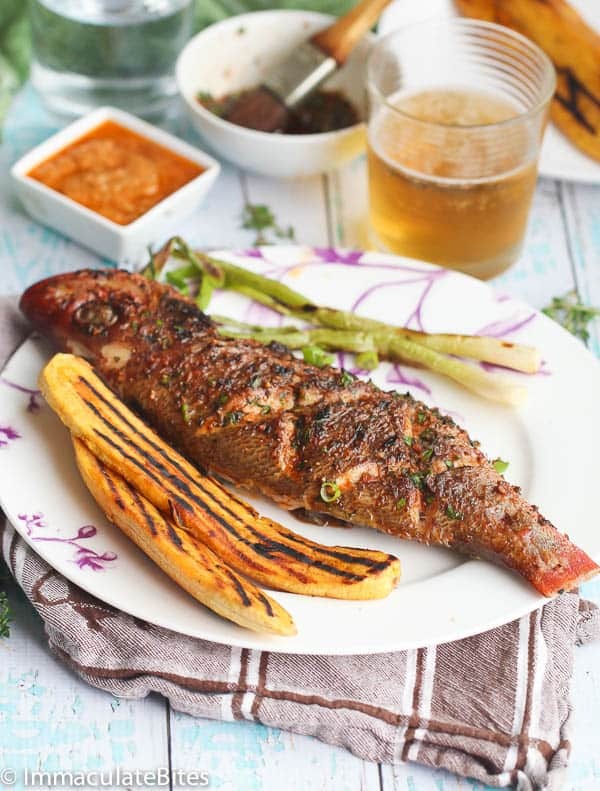 Caribbean Grilled Whole Red Snapper- Fairly Easy to make with a great blend of spice- Moist, tender and flavorful. In a small bowl mix all the ingredients( white pepper, all spice, minced garlic , ginger, paprika, thyme, basil, parsley , chicken bouillon and oil ) to make marinade for fish. If you are using a small bbq grill, leave the fish on the open grill or hot charcoal. Check for doneness by making sure the meat closest to the bone is fully cooked – slash with a knife to check. Grill on each side for about 3 minutes until fully cook through – watch carefully because they burn easily. This was absolutely mouth wateringly delicious. I didn’t have time to do a full marinade, was compressed for time, but it was excellent. I can’t even begin to imagine what this would taste like if it were able to marinate the full time. It would be mind blowing. Made this and we are a family of three. My red snapper was pretty big costing me $40+ dollars, so I was worried I would ruin this and waste my money. But it came out beautifully and the flavor was awesome! We cleaned it to the bones. They are already asking for me to do this dish again. THANK YOU!! So awesome! Thank you for taking the time to let me know, Nikki! I made this for my 4 and half pound snapper. This was so freaking delicious, I got nothing but compliments! I also made the hot pepper sauce to go with it, and all I can say is WOW. I did have to dial down the heat on the pepper sauce by adding an additional mango, but it was super yummy! Thank you for the recipe! If this fish is cooked on a grill should it be directly over the coals or cooked by indirect method? It works both ways . However, for a first timer it’s best to grill using a grill or fish basket. Easier to flip fish around without it falling apart. I will be marinating my snapper this evening. Can’t wait to try it tomorrow! Thanks for the recipe! Oooh, I could taste it all the way here, Alisha! Please let me know how it turns out for you. Enjoy! It easily lifts off the bone. You can Use a knife and fork to lift out the flesh in sections from the flat bone. And the skin is edible – one of favorite parts . Have a Safe Trip!!!! Any works here. I usually use the powder granules . You can dissolve the cubes and add to taste. Can I just sub a jerk marinade that I purchased ( and been dying to use) on the fish in put in the oven? Or will it overpower it? Hi Nichell! You sure can. I have used jerk marinade with fish before and it tasted great! Give it a try! . Happy Cooking!!! I hardly grill fish without a fish grill basket, it makes it SO much easier to handle. You just use the handle to flip it over. You grill until the flesh just flakes with a fork, about 5 minutes per side add a few more minutes , as needed. I used this recipe, and it was the best grilled fish! I am in love with the marinade. It was easy. My fish was to Large for a basket, so I laid lemon slices on the grill and put the fish on them. The tail fell off when I flipped it, but, I was able to get it cooked and flipped without it sticking or falling apart. It came out perfect! Will definitely use this recipe from now on. Yeah! Good to know it worked out so well for you Donna! Thanks for taking the time to let me know . Would you recommend using dried basil and parsley for theis recipe? Thank you. 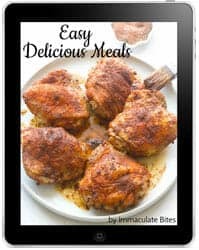 I have been looking at some of your recipes and they are great. My fiance and I are getting married in UK in July and we want a Caribbean inspired bbq. Hi! I would go with Jerk Chicken , ribs, Fruity Coleslaw, Rice and Beans, Caribbean Potato salad, plantains , rasta pasta , anything with pineapple . I have read the other comments, and still am puzzled about instruction#8 referring to fish spice. I used all the spices in the marinade as instructed. Awesome! Glad to have you here. I love the way you response to our questions and comments. I can tell from the ingredients and preperation ,this is a great recipe. I will make this. Yay!! You are two kind. Thanks for taking the time to share your thoughts with me. Sounds good but the recipe is not clear to me. You have used different terms – marinade, fish spice, pepper sauce and spice mix. Do you mix all spices on the list, to make what you are calling marinade, fish spice, pepper sauce and spice mix, to rub inside and outside the fish before refrigerating for up to 24 hours? Then, is this same spice rub is used for plaintains? Hi Barb! Yes, it’s the same spice I use to rub plantains. All the spices or ingredients are mixed together to form marinade for the fish. Pepper sauce is extra to serve with the fish. There is a link up to Caribbean pepper sauce .Recipe updated! Wow. I have cooked Red Snapper so may ways, but this was such an awesome flavour and so moist. My Pleasure Andy! Glad yours girls enjoyed it too!! I use my dinner fork to gently pull the meat from the bones. The tines can slide between the individual bones and a perfect bite slides off the end leaving the ribs intact. Thanks for chiming in Doug. Will grilling wrapped in aluminum foil work for this recipe? Cooking in foil made helped seal the moisture of the fish and flavor from the citrus & herbs. Easy recipe to follow with excellent results. Awesome! Thanks for taking the time to let me know. hi, what a great recipe. Can you me the best way to remove the fish bones after the fish is cooked? I usually just do a gentle pull. Nothing special. When do you apply the paprika? The recipe says spices – paprika. With the rest of the ingredients. What did you do with the basil and thyme..? Added it to the blend of other spices . Hi everyone I know this is old hopefully someone around, what about the bones? Do I cut them out? Good ole grilled snapper, oh how I long for some, you really know how to tempt me Imma. I LOVE whole fish! Being of Asian background, I grew up eating whole fish. It’s the BEST, just like chicken, so much juicier! The flavours in this are a ripper! hello, nyc one! am not a big fan of fish but i will love to try this. what other ways can one prepare this cos i dont av a grill and i cant afford one now. thanks once again. Hi Joan, place the fish on a an oiled baking sheet (generously oil to prevent sticking). Then bake at 375 degrees F for about 25 minutes or more – until the fish just flakes- Remove, let it cool and transfer to a plate.